Strawberry Chia Seed Jam is an easy to make Jam with only 3 ingredients. You can control the sugar content and also the artifical ingredients that usually is required to make other jams. Once you try this version, you may not ever go back to your traditional jam again! My daughter moved back home, and when she did, she introduced me to this recipe from The Busy Baker. 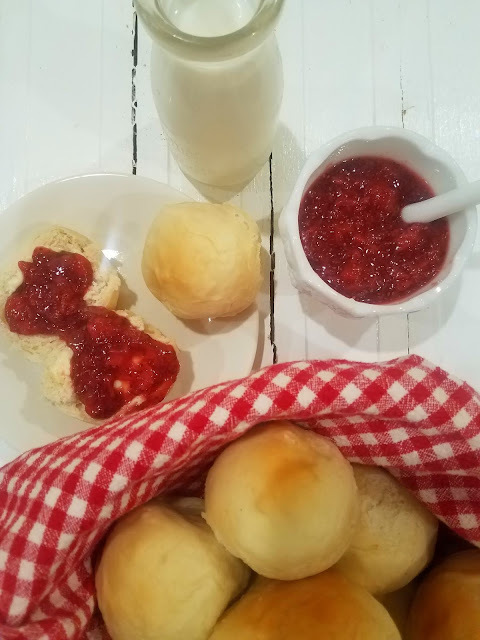 My husband is a diabetic and controling sugar is important to him, and my daughters health requires her to watch her Sugar consumption also, so this homemade Jam with honey in it, and a natural Chia seed as the thickener is the perfect answer. She made the rolls too! These are the "famous" Lion House Rolls! Ok.. if you aren't familiar.. just google it. You'll find a kazillion blog posts on versions of the recipe I promise! 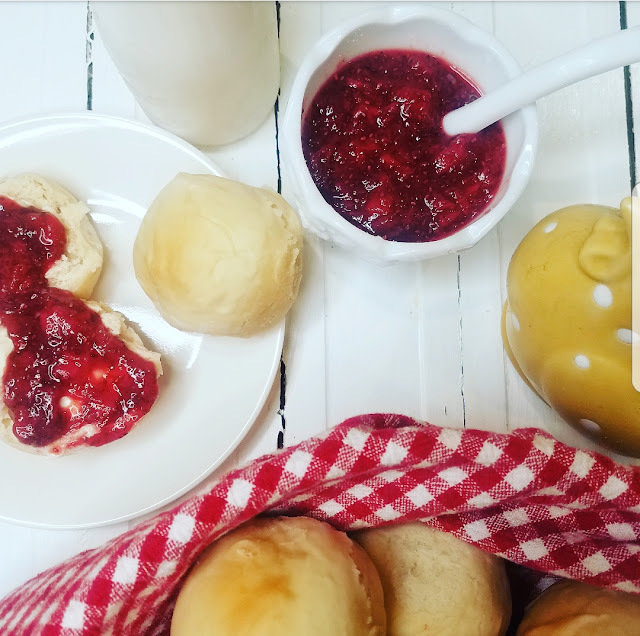 They are easy and quick to make and scrumptious with the Jam! we love using locally sourced honey and strawberries for our jam! Jan's Tips' This makes a great freezer jam. But you can also "Can" this jam, just follow the traditional canning instructions for regular strawberry jam. A Strawberry Jam with 3 ingredients, where you can control the amount of 'sugar'content. Made with a natural thickener of Chia seeds, you'll never guess they're in there! Simply Scrumptious! Heat a medium saucepan over medium heat and add the strawberries and honey. stirring strawberries as they begin to heat up and soften. Mash the strawberries to break them up into smaller pieces. Let the mixture come to a slow boil, stir continually. Once You see Bigger Bubbles on the surface, add the chia seeds. The chia seeds will help thicken the jam. For chunkier Jam pour mixture into jar and seal with lid. For Less Chunky jam, run jam through a blender, or use immersion blender in the sauce pan, to desired consistency. Pour into Jar and seal with a lid. Jam will thicken as it cools! while it is still hot, it will seem runnier than you may wish, no worries! they Chia seeds are hard at work. Let the jam cool to room temperature in the jar before placing in the fridge for several hours. then it will achieve a perfect Jam texture! It keeps for a couple weeks in the fridge, but beware: since it doesn't contain any preservatives and hasn't undergone the proper canning process it must be kept refrigerated.